She was kind enough to answer my questions, and my anticipation for the novel is higher than ever. Airborne societies are scarcity societies. That initial prompt didn’t result immediately in a novel, but rather a (very) short story. “It was about 1500 words,” Wilde remembered. “When I disassembled it, however, I realized I wanted to know much more about the kind of society that would live on towers of bone — how they survived and fought, what their fears were. “The cover artist is the amazing Stephan Martiniere,” Wilde said when I asked her about the gorgeous cover. Martiniere’s a favourite of mine, and it’s lovely to see him exploring the world outside of his usual cityscapes. “I love how the cover captures motion and flight,” Wilde continued. “As well as the true strangeness of the towers, and the society that’s grown up with them. I am eagerly awaiting the wraps, because the landscape Martiniere’s created is so stunning. The colors — sky blue, cloud and tower whites — and those wings! I’m delighted that the towers seem so mysterious and weird while the flier on the cover already feels familiar, strong, and pretty badass. But what’s a pretty cover if the words inside don’t excite you? Readers don’t have to worry there, as Wilde was eager to tell me about all the “adventure and unexpected twists” between the covers. “There’s this odd knife-fight in a wind tunnel,” she said. “I did research at the same indoor skydiving center where at least one military school skydiving team trains in order to figure out what the physics might feel like. For more on Updraft, and Wilde’s unique take on fantasy worldbuilding, be sure to check out her feature article here on A Dribble of Ink, Gravity’s Own Monster! 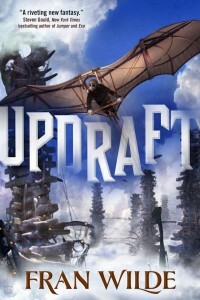 Updraft will be available on September 1, 2015 from Tor Books, and is available now for pre-order. It’s an unusual Martiniere cover, at that. Not what I normally think of his style.